What’s included: Green Eco Club markets itself as a ‘support system’ for people wanting to live a greener lifestyle. Aside from the informational resources, the program helps individuals connect with like-minded people, groups and even experts in the renewable field. You can get the product for a discounted price, from the official supplier, by following this link. 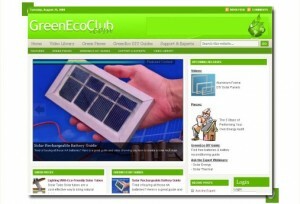 For a monthly subscription, members get expert support for their own DIY projects, access to a large ‘green’ video and audio library, weekly green living tips, a new DIY guide each month (each worth approximately $50), a well-maintained list of various green and renewable energy resources online (including tools and supplier discounts), and access to six bonus products (some of which we have already reviewed as standalone packages, notably ‘Green DIY Energy’, currently retailing at $47). The program aims to help reduce an individual’s carbon footprint by up to 20% and reduce energy bills by around a third within a matter of days. There is a 60-day full money back guarantee and buyers are not obliged to return the bonus material after their refund (a large commitment from the vender we thought). Of the many green products we’ve reviewed here at IPR, this product scores top in terms of value and benefits delivered. The initial energy audit is a great way to start the journey to a greener lifestyle, and a quick search on Google shows similar audits from consultants costing thousands of dollars (this product won’t turn you into an ‘energy consultant’ overnight, but for a family home or small business, these methods are more than enough). I have to caution that the amount of information offered by this program was a little overwhelming – if you plan to subscribe I’d recommend starting small, pick a sub-category and work from there (e.g. wind energy, or focus on simply lowering your current energy usage before trying to create your own power source). As mentioned, several of the bonus products are sold as standalone items by other venders, notably Green DIY Energy, currently retailing at $47 (we scored this product 4/5, you can read the review here) – I’ll say it again, there’s a lot of information here! It was encouraging to see the program regularly updated with fresh content – at the time of this review, Green Eco Club are offering a guide to creating your own aluminum frame DIY solar panels as well as supplementary tips to the energy audit outlined above. There’s a real sense of community about the program and newbies will find the ‘ask an expert’ feature particularly useful (let’s face it, building a solar panel isn’t easy) – I’ve not seen such a feature advertised with other products in this sector. The venders are also keen to point out that part of the membership proceeds are used to fund the SolarGoodWill trips – a program helping remote villages in third world countries build their own power source (at the time of this review, their previous trip was in Nicaragua). For the monthly subscription users get access to a level of information that far exceeds the price tag. Green energy is a lifestyle, not a one-off event, and the membership/community model offered by Green Eco Club is a much more realistic approach to adopting that lifestyle than a one-off product with limited support or follow-up. Like with all products reviewed at IPR, we’re always keen to stress that nothing is achieved without time and dedication – that advice is probably more relevant with this program than any other… Paying the subscriptions gives members access to a huge amount of information immediately – to get the most from it, you must start with one area, and commit a few hours each week, rather than simply diving in head first. Overall, if you’re looking to adopt a greener lifestyle, or trim those energy bills, then this is a great value option vs. alternatives currently on the market. One could realistically review a most of the information and perform a home energy audit within the 60-day money back window, so the risk of being disappointed really is limited. If you’d like to learn more about the Green Eco Club, or join for the special monthly rate, you can do so by clicking the box below. Alternatively, please use the comment thread below to post any questions or feedback of your own related to this product.